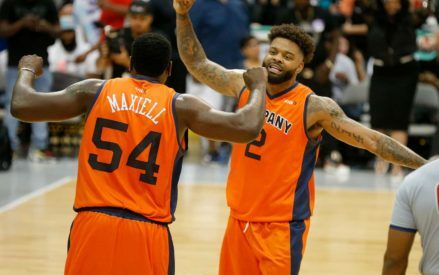 The BIG3 closed out the 2018 regular season Friday at Infinite Energy Arena in Atlanta with playoff seeding and individual honors up for grabs. The schedule turned out pretty quirky, as the four teams that have already clinched the four playoff spots faced off against the four teams that have been eliminated from the playoffs. But competition has been at a high level throughout Season 2 of the BIG3, so nobody expected a letdown. In Game 2, Reggie Evans had another monster game for the 3-Headed Monsters, who clinched at least the No. 2 seed. Game 3 featured the much-anticipated rematch between Trilogy and Tri-State. With coach Rick Mahorn unavailable, Trilogy captain Kenyon Martin coached his defending champs and revenge was had. Needing a win in the final game of the night to clinch the top seed, Power took care of business with a 50-40 win over the Ball Hogs. Power and the 3-Headed Monsters tied for first place in the regular season, with Power earning the top spot thanks to their head-to-head victory just last week. The Killer 3s avenged a Week 1 loss to 3’s Company, and as usual “Stak” Jackson led the way. Battling for playoff seeding, 3’s Company kept it close, but they were playing come-from-behind most of the night. Jackson’s first 3-pointer capped an 8-0 run for the Killer 3s that gave them an early 11-4 lead. Eventually, 3’s Company tied it at 20, before Mike James hit a mid-range jumper and then a 3-pointer to give the Killer 3s a 25-20 halftime lead. After the Killer 3s scored the first 6 points of the second half to take a 31-20 lead, 3’s Company clawed back again behind Andre Emmett and Jason Maxiell. But when Alan Anderson hit his fourth 3-pointer of the game, the Killer 3s had a 46-42 lead. One possession later, Jackson’s second 3 made it 49-44, and then Anderson hit a jumper for his second game-winning shot of the season. Jackson led his squad with 22 points 7 rebounds. Anderson had 16 points and 5 rebounds. Emmett, who scored 44 points in the last two weeks, added another 22. Maxiell had 16. Playoff seeding and individual honors were at stake here. Not only did the 3-Headed Monsters keep hopes alive for the top overall seed, but Monsters co-captain Reggie Evans had a monster game to clinch the BIG3 rebounding title for the second straight year. Evans had his league-leading fifth double-double of the season – and he nearly became the first player in BIG3 history to record a triple-double, finishing with 15 points, 12 rebounds and 8 assists. The game started close, then the Monsters went on a 7-0 run to build a 19-11 lead. Mahmoud Abdul-Rauf had a hot hand from the start, and when Jamario Moon’s put-back gave the 3-Headed Monsters a 25-15 lead, Adbul-Rauf led all scorers with 11. Evans scored the first five points of the second half as the lead grew to 30-15. Ricky Davis hit a 4-pointer for the Ghost Ballers and Mario West gave the Ballers a spark, but the 3-Headed Monsters were too much. An Evans rebound and put-back gave them a 49-37 lead, then Moon hit his second game-winner of the season. Moon finished with 8 points, while Abdul-Rauf had 19. Davis led the Ghost Ballers with 16 points as he won the 2018 scoring title. Carlos Boozer has 13 points and 8 rebounds. Tri-State’s shocking Week 1 upset of Trilogy set the tone for both of these teams. Even though the defending champs never recovered and are out of the playoffs, they were hell-bent on getting revenge here. And they set the tone for this game early. After the game was tied at 4, Trilogy went on a 15-0 run. By halftime, Trilogy had built a commanding 26-12 lead. Rashad McCants and Derrick Byars led the way with 9 points each. David Hawkins, who began his MVP-caliber season in that Week 1 win with 19 points, scored the first 5 points of the second half to mount a comeback, but then Trilogy’s James White swung the momentum with a 4-pointer. When McCants was forced out of the game with a cramp, Hawkins led a Tri-State comeback. After a 15-4 run, Trilogy’s lead was cut to 46-40. In one of the most physical games of the season, Al Harrington hit a foul shot to make it 48-40, and when Trilogy maintained possession they went right back to Harrington, who banked it in for the game-winner. Harrington had his second double-double of the season with a game-high 17 points and 11 rebounds. Byars, McCants and White each had 11. Hawkins led Tri-state with 13. With Tri-State’s loss, they finish the regular season as the No. 4 seed. Based on their head-to-head win over Tri-State, 3’s Company locks up the No. 3 seed. 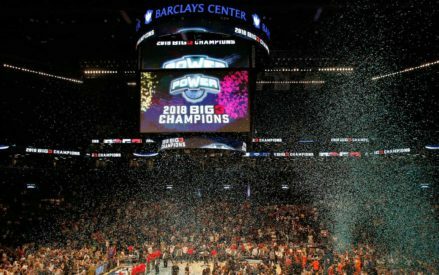 Power grabbed the top seed in the league last week and they clinched it here, winning their fifth game in a row and entering the playoffs as the favorites. Glen “Big Baby” Davis opened the night’s scoring with a 3-pointer, but it was really Power’s big men down low who carried the game. Davis was a force under the basket, while Cuttino Mobley and Chris “Birdman” Andersen had 2 blocks apiece. That defense helped Power build an 18-8 lead, though a pair of 3-pointers from Josh Childress got the Ball Hogs close. Power went into halftime with a 25-22 lead. The Ball Hogs closed to within two early in the second half, at 29-27, but it was all Power after that. Power closed the game on a 21-6 run as Andersen laid in his second game-winning shot of the season. Mobley led all scorers with 18 and Davis finished with 14. Childress led the Ball Hogs with 12, while DeShawn Stevenson hit a pair of 3-pointers to clinch his second straight BIG3 3-point crown.